All the gorgeousness of my favorite summer salad, baked into a lovely crusty loaf, with basil proofed in the dough, mozzarella tucked inside and, finally, a smattering of colorful little tomatoes roasting on top. It’s summertime and that means plentiful, flavorful tomatoes and long and leggy overgrown basil. Which makes this the perfect season for making Caprese salad. And crusty Caprese bread. 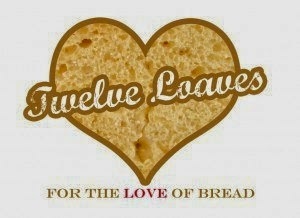 This month Twelve Loaves is celebrating summer fun! We’ve got nine great recipes for you and hope you will be inspired to turn that stove or oven on, despite the heat. What’s your favorite taste of summer? Aside from the cherries and homegrown tomatoes, mine has got to be fresh purple hull peas, which are really a type of bean. They are hard to come by most of the year but my farmers’ market in Houston has them during the summer and they are divine. A fresh bean is NOTHING like its dried cousin. If you’ve never tried them, start looking for them now. Well, right after you bake some bread, okay? Put 1/4 cup or about 30g of flour into your large mixing bowl with the sugar and yeast. Add the tepid water and stir well. Allow to proof for 10 minutes. If the yeast gets foamy, it’s all good. Meanwhile roll your basil leaves up really tightly and slice thinly. Fancy chefs call this chiffonade and you can too. When the yeast mixture is ready, add in the basil and stir. Add in the rest of the flours and the salt. Mix until well combined and you have a soft dough. If you are using a stand mixer, change to the bread hook and knead. You may have to add a little more flour. Otherwise, remove from the mixer and knead by hand until smooth and stretchy. Form into a nice round ball. Drizzle a little olive oil in your bowl and roll the ball around until coated with oil. Cover the bowl and put in a warm place for a couple of hours. You can continue the process at this point or you can let it rest overnight in the refrigerator for added flavor. If you put the dough in the refrigerator overnight (like I did) remove it and allow it to come to room temperature before proceeding. Meanwhile you can cut your mozzarella into thick slices. Punch down the dough and form it into a nice circle again. Put it in a greased pan. Use a sharp knife to cut deep slits in the dough and tuck a slice of mozzarella into each. Pierce a hole with that same sharp knife in each small tomato and push them into the dough. Cover with a mixing bowl and put in a warm place to rise for about an hour. Set your timer for 45 minutes and preheat your oven to 375°F or 190°C when it rings. Bake the loaf, uncovered, in your preheated oven for about 25-30 minutes or when the internal temperature of the loaf reaches 180°F or 82°C. If you want a crusty loaf, turn the oven off and leave the bread in it for 10 more minutes. Otherwise, remove from the oven and allow to cool. Remove from the loaf from the pan and cool completely on a rack. If you can wait that long to slice it. Check out all the beautiful summer breads we’ve been making for you! Would you like to join us this month? Choose a recipe featuring the flavors of summer! Whatever you bake (yeasted, quick bread, crackers, muffins, grissini, braids, flatbreads, etc.) have fun and let's have a delicious month of seasonal bread. Let's get baking! If you’d like to add your recipe to the collection with the Linky Tool this month, here’s what you need to do! 2. Please link your post to the linky tool at the bottom of my blog. It must be a bread baked to this month’s Twelve Loaves theme – Summer Fun. 3. Have your Twelve Loaves bread that you baked this July 2014, posted on your blog by July 31, 2014.